Perhaps it’s not so much the dinner but rather what the Fish Fry represents. In a way, the atmosphere of a Fish Fry represents Lenten Catholic nostalgia in Wisconsin. It’s what many of us did during Lent growing up. 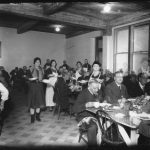 Situated in a church basement, parishioners of all ages – from the elderly to the very young – come together to share a simple meal. You’ll find paper placemats, coffee in a carafe, milk served in good old fashion plastic cups and cafeteria serving trays. Oh! And, yes, you will find a good meal: fried cod, your choice of baked potato or fries, coleslaw and a warm roll. Perhaps, the greatest treat is the assortment of desserts baked, personally, by the very gifted and talented St. Anne parishioners who love to bake! At this Fish Fry, we collect money and tickets, we cook, we serve each other and we clean up just as a family does. In today’s fast-paced, hectic world, a Fish Fry offers a time to slow down and be present for each other…to our family members of St. Anne. Maybe you didn’t have the Fish Fry experience growing up, and so you’re not so inclined to spend a Friday night in a church basement. Either way, let me share with you five reasons to consider attending the St. Anne Fish Fry on Friday, April 11 at St. Elizabeth Catholic Church. 1) It’s a good meatless meal. Running out of meatless meal ideas? Or, better yet, who isn’t tired on a Friday night? Why don’t you just skip cooking and enjoy a really good meal. Your kids can enjoy grilled cheese if they don’t like fish. 2) Fellowship. You’d be amazed at how good it feels to get to know your fellow parishioners. I met many people at our first Fish Fry in March, including a young couple and who are relatively new to the parish, Troy and Yolanda. They have a 2nd grader making his first communion this year, and 4th grader who just joined the server ministry. Oh, they were such a cute, sweet couple. They are thrilled with our new altar server ministry. What a joy it is to move out of my comfort zone, and actually have a bit of time to learn who sits next to me at Mass. 3) Service. This event is open to the community. As a parish, many volunteers come together to handle all the service elements of the Fish Fry, from cooking to serving to cleaning. It’s quite humbling and rewarding to be a host for the community…in a way to see the many faces of Christ! In fact, it can even be sacrificial at times, serving coffee to a curmudgeon, who thinks he’s in his local diner…which brings me to the next point: charity. 4) Charity. A Fish Fry allows us to love our neighbor. Those who have volunteered actually say they receive more than they give. Those who attend say that it’s just nice to visit and chat with someone for more than five minutes after Mass. Truly, it can actually be a heartwarming experience. 5) It’s Lent. During Lent, we are called to slow down. We are called to prayer, fasting and almsgiving. Perhaps a stretch, but I contend the Fish Fry experience calls us to experience all three aspects of the Lenten practices. Prayer is one of the three pillars of Lenten practice. Through prayer, we raise our hearts and minds to God in thanksgiving and praise. At this Fish Fry dinner, we pray and give thanks to our Lord for the meal, the many blessings of our parish and for each other! 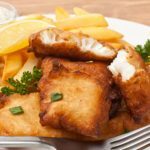 With ‘fasting and abstinence’ the Fish Fry allows us to reflect on why we abstain from meat on Fridays during Lent…to empty ourselves in order to make more room for Him in our hearts. Almsgiving means donating money or goods to the poor and performing other acts of charity. Almsgiving is “a witness to fraternal charity” and “a work of justice pleasing to God.” (Catechism of the Catholic Church, no. 2462). Did you know that all proceeds from this Fish Fry will go toward the finishing of our St. Anne Gathering Area? I invite you to experience the St. Anne Fish Fry! Make new memories with your own family and get to know your St. Anne family. You might even leave with a fresh new feeling of church basements. Special thanks to St. Elizabeth Parish and Fr. Sean Granger for generously sharing their facility and their long-standing Fish Fry for the benefit of St. Anne; and special thanks to our own Rich Mich for tirelessly organizing this wonderful family event.